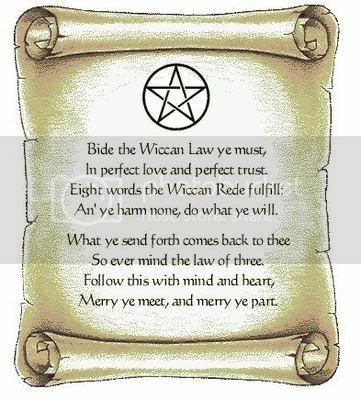 If you don't know what Wicca is, just ask, or go here. "We are not evil. We don't harm or seduce people. We are not dangerous. We are ordinary people like you. We have families, jobs, hopes, and dreams. We are not a cult. This religion is not a joke. We are not what you think we are from looking at T.V. We are real. We laugh, we cry. We are serious. We have a sense of humor. You don't have to be afraid of us. We don't want to convert you. And please don't try to convert us. Just give us the same right we give you--to live in peace. We are much more similar to you than you think."